What is an insulator, anyway??? 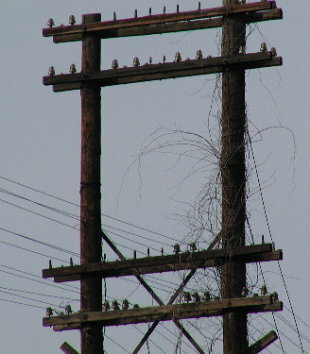 Insulators are those things on telephone and electrical poles . Most are made of porcelain or glass. Over the years, they have been made of wood, glass, porcelain, steel, rubber, fiberglass, composite... Well, you get the idea. Many different designs have been used to accomodate many different functions. 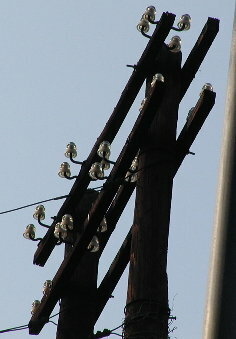 The basic function is to keep the wire from touching the pole using some material that doesn't conduct electricity. CD 154s on old poles crossing the Baltimore Beltway. 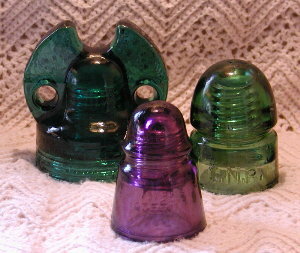 A few colorful and shapely insulators in their new home (which also happens to be my home).